The Vosges department is home to some of France's greenest scenery with dense forests occupying most of the landscape. The mountain range after which the department is named forms the eastern border whilst the rest of the area is situated on an elevated plateau. There are two regional parks that are well worth exploring in the Vosges. One is the Parc Naturel Regional des Vosges du Nord, which is home to around 76,000 people living in 102 towns. The other is the Parc Naturel Regional des Ballons des Vosges, which is slightly larger with 199 towns and 245,000 inhabitants. 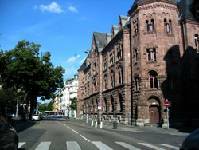 Epinal, situated at a crossroads at the base of the Vosges Mountain Range, is the departmental capital. Despite suffering badly during the Second World War, the town has re-established itself as a focal point for the region's economy and culture. The pretty, flower-adorned streets were once home to a very prosperous cotton and print industry. Lorraine's most popular museum, the Musée Départemental d'Art Ancien et Contemporain is also found in Epinal. St-Die, is named after its 7th century monastery. The town has either been very lucky or unlucky depending on your point of view. Four times in its history, a fire has threatened to wipe out the entire town, whilst four times the town has recovered and set about repairing the damage. In the west of the department, located at the confluence of the rivers Meuse and Mouzon, is the market town of Neufchateau. The town became prosperous during the 14th century after becoming the first free city in the Duchy of Lorraine. It has retained its ancient fair held every year in August. There are currently no airports within the department offering direct flights to/from the UK. You could fly to the Paris airports, and continue by rail or road from there. Or there is Basel/Mulhouse airport which is much nearer (just over 100km), which currently has easyJet flights operating to/from the UK. However, if you'd rather take the car, your nearest ferry ports are Le Havre, Dieppe, Dunkirk and Calais. The TGV also serves the department. Despite the many affordable properties and relatively low cost of living in the Vosges, the area is still not very popular with the second home or international property market. This may change however, with the arrival of the TGV link in 2007. Do you know Vosges better than we do? Do you have photos of Vosges? The Vosges is located in the south of the Lorraine region.